It's time for another Healuxe Beauty introduction! It's been a few weeks since my last introduction, but I'm really excited to tell you guys a bit more about today's brand. 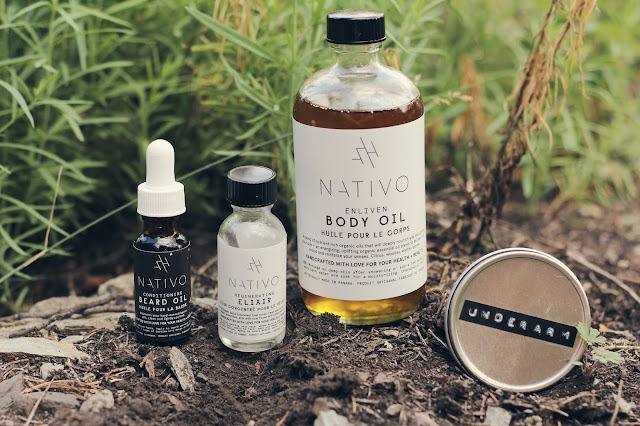 It's seriously beautiful, and all the way from Panama - the wonderful NATIVO Skincare. Handcrafted in small batches with unique and effective ingredients, this line is full of some truly beautiful products for all types of skin concerns and types. I've been trying out a good chunk of the line for the past few weeks and am ready to share my thoughts on these great products. First up let's talk about a few body care gems from NATIVO. I've been trialling the brand's Bath and Body Oil* in the scent Enliven, a combination of essential oils that provide you with seriously hydated skin, along with a calming, earthy aroma. This is the most generously sized body oil I've ever tried, and I'm ecstatic about that because it's gorgeous and looks like it's going to last me forever. It's also available in the scent Ground, which is described as a more floral, herbaceous and spicy aroma that sounds lovely! The other two body care products I've been trying out are brand's Underarm Potion* as well as their incredible Honey Body Scrub*. The Underarm Potion is an all-natural deodorant that comes in a little tin, with a creamy formula that is easy to grab the perfect amount of and rub into your underarms. It contains a blend of natural oils, minerals and earthy ingredients that work well to detoxify and neutralize odors. What I like about it is that it's quite soothing (a rare quality in many natural deodorants which I find irritating to my underarm) and it also comes in a really subtle gender-neutral scent, meaning it's not ridiculously pungent for any people that might be opposed to that. The Honey Body Scrub is one of my definite highlights from the line. This all natural scrub contains the very important ingredient of honey (go figure) that acts as a wonderful antibacterial, soothing agent along with the exfoliating aspect of the scrub. I cannot tell you how much I love this gem - it's exfoliating, soothing, cleansing and smells amazing all at the same time. One of the best scrubs I've ever tried, hands down. Now onto the skincare. What I love so much about NATIVO is it offers skincare for both men and women, something I feel not enough lines do. One item that's intended for men is the brand's Beard Oil*, a concussion of Vitamin E, Argan Oil, Sesame Oil and Grape Seed Oil that men can rub through their beards to soothe, soften and promote healthy growth. While I haven't been able to use this myself, I handed it off to my boyfriend who reported some great results. As for the products I've been loving, I cannot get enough of both the brand's Face Wash* and their Elixir*, a wonderfully soothing and hydrating toner. The Face Wash is an incredibly gentle, creamy formula that is effective at cleansing your face without ever stripping your skin of its natural oils. As someone who has fairly dry skin (even during the summer, which is simply wonderful) I really enjoy how soothing and hydrating this cleanser is, all without drying my skin out further. The same could be said for the brand's star product (in my humble opinion), the unbelievably great Elixir. I've been trialling this dreamy product out for several weeks, and am just getting to the bottom of my travel size bottle. I am dying to get my hands on the full size because this product is truly life changing. With ingredients such as Aloe Vera, Grape Seed Oil, Organic Witch Hazel and Vitamin E, this is one-of-a-kind toner. By rubbing a bit of this onto your skin using a cotton ball, it actually will help to heal and moisturize your skin, healing blemishes and fading scars. Using this on my currently blemish-prone skin has made a world of difference, helping my acne clear quicker without causing it to dry out and leave behind dry patches. All the products from NATIVO are wonderful, but I hold a special place in my heart for this guy and how well it has treated my skin. Have you guys tried anything from NATIVO before? I cannot wait to sell it on Healuxe and see what you beautiful folks think of it! This line sounds wonderful!! As its hand crafted I assume its cruelty free.